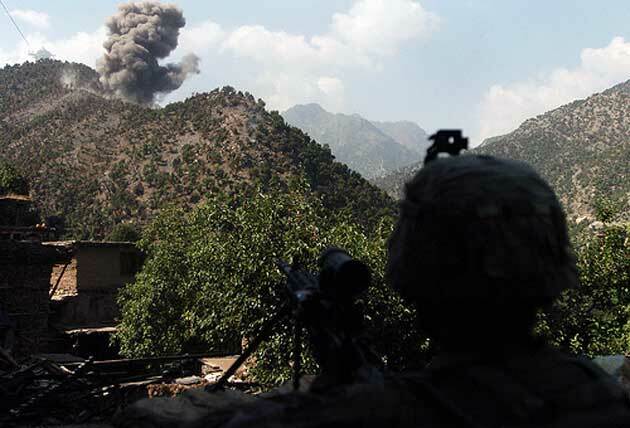 A U.S. Army Soldier watches as U.S. Air Force F-15 fighter jets destroy insurgent positions with a bomb, after a 20-minute gun battle in Kunar province, Afghanistan’s Korengal Valley, Aug. 13, 2009. U.S. servicemembers from Company B, 2nd Battalion, 12th Infantry Regiment, 4th Brigade Combat Team, 4th Infantry Division, routinely engage insurgents in the volatile valley. U.S. Army photo by Sgt. Matthew Moeller.